Don’t tell me you couldn’t just about dig into one of these Steak Chimis right about now. Even as I write this I’m mourning the fact that they’re all gone. And so is my leftover steak or I might just whip up another one right now. And what on earth are you going to do with leftover steak? I mean, seriously, once I have my fill of steak, I’m not wild about it hanging around in the fridge, mocking me every time I open the door. It seems to say, “Here I am and I’m never gonna be as good as I was last night.” But to waste it? Shush your mouth. Never! All that leftover steak caused me to get pretty creative. I’ve even put together a whole collection (link at the bottom of the page) and it includes a couple steak salads, like my California Steak Salad with Sweet/Spicy Asian Vinaigrette and my Steak & Veggie Ramen bowls along with my Simple Steak Tacos. See, those recipes are just a little tease of what’s in my Leftover Steak post, and every recipe is just as good if not better than the original steak. If you don’t have leftover steak, leftover roast or another beef of just about any type will be marvelous, too. Steak Chimichanga with Green Chili Verde Sauce is an under 30-minute recipe for sure, especially if you are baking them. Frying will take a little more time and attention. All you do is saute up your onions and green peppers, toss in some spices, green chilis and fold in the cheeses for a super creamy filling. Add the steak and wrap and roll. The sauce is so quick and easy it can be made as the Chimis bake or fry. Watch for stellar specials on steak during any of the Summer holidays, and around New Year’s and Valentine’s Day. Stores will often have a steak or two on special to draw you in the door, so take advantage of it. Although steak can be pricey, serving it as a main meal the 1st night and using any leftovers on another is a great way to stretch steak or any pricey food item. Watch for Mexican items to go on sale sporadically, especially around Cinco de Mayo and stock up on the long-lasting pantry items like green chiles, salsas, hot sauces, beans, dry or canned and so on. As far as the cream cheese, sour cream, and cheese? Use your coupon matching site – they’ll find you the best deals whether you actually use coupons or not. Cream cheese and the regular grocery store cheese can be frozen (texture will be affected, so it’s best to use in dishes rather than eating out of hand) and both have long shelf lives, unopened. Keep your sour cream clean (no dipping into with dirty spoons) and covered (spoon a little out, but cover it after, even if you just loosely plop the lid over. Store it upside down in the fridge. Better than any restaurant Steak Chimi! First make the easy filling, then assemble. 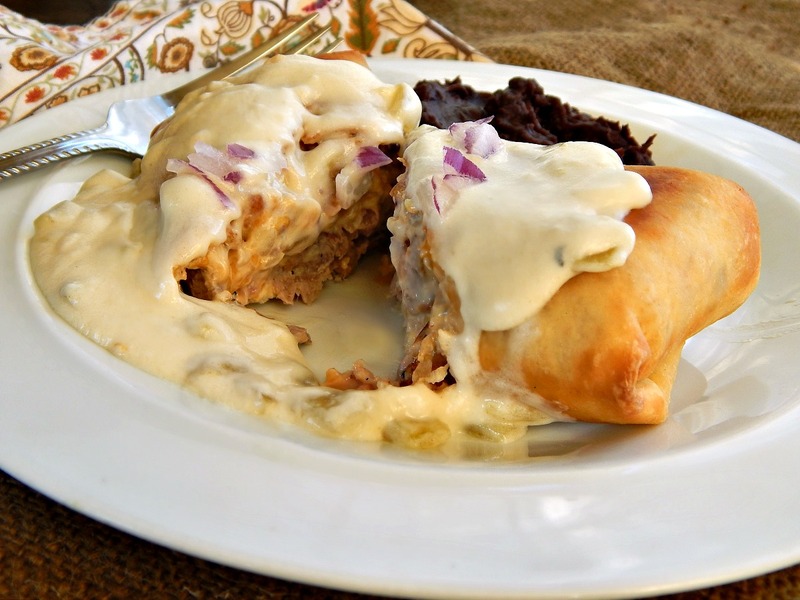 The quick sauce can be made as the Chimichangas are baked or fried. Arrange tortillas on a flat surface and add 1/4 of the steak mixture halfway between the bottom edge and the center of the tortilla. Smooth filling into a rectangular shape with space to the left and right. Fold up the bottom of tortilla then fold in the right and left edges, securing the filling in the center. Continue to roll the bottom edge up and over, into a cylinder shape, securing with a toothpick. To fry: Pour enough canola oil into a saucepan to reach about 1 inch deep; heat to 375 degrees F (190 degrees C). Fry on each side for one to two minutes until golden brown and crispy. Drain on paper towels and serve immediately napped with the sauce. To bake: Preheat oven to 375 degrees. Brush the chimichangas with oil and bake until golden brown and crisp, 4 to 5 minutes per side, turning after the first side is browned and crispy. Serve napped with sauce. Heat butter in a small saucepan over medium heat. Stir in the flour, and cook for 1 minute, stirring constantly. Whisk in the broth and bring to a boil until sauce has thickened. Add the reserved canned green chile, and remove from heat. Stir in the sour cream. Taste and add salt and pepper and cayenne or chili powder if using. Keep warm. Divide over Chimichangas when serving. Chimichangas can be baked or fried until just lightly browned and frozen, wrapped in foil. Reheat in the oven, unwrapped, at 375 degrees until hot throughout. This’s a special week for me: I’m hosting, along with Aruna @ Aharam on Angie’s Fiesta Friday #122! Come and see all the great links, stay awhile, mingle! Also, of course, we have our very own Throwback Thursday Link Party, hosted by Quinn of Dad What’s for Dinner, Meaghan of 4 Sons are Us, Alli of Tornadough, Carlee from Cooking with Carlee and Moi! That’s right – me! This entry was posted in Click here for Bargain Meals, Click here for Fabulous Food Posts and tagged Bargain Meal of the Week, Bell Peppers, Cheese, chimichangas, Cream Cheese, Deep Fried, Freezes Well, Frugal Hausfrau, Green Chili, Hot Peppers, leftover beef, leftover steak, Mexican or Southwestern, Sour cream, Steak, tortillas. Bookmark the permalink. Omgz, this one I need to save, too. Most days you’ll find me scratching my head what to do with leftovers. And yes, I do have leftover steaks sometimes! I couldn’t even finish my 6 oz steak the last time I ordered it. Of course I had 2 appetizers, lol! I can’t remember us ever having us having leftover steak, but I am going to have to make some when husband isn’t watching so we can have these chimichanga’s! YUM! Finally hit the bloglovin’ button to follow you! LOL! I love it – when my husband isn’t watching!! 🙂 Trust me, this is worth it!! What a great idea for a stir fry! Half the work already done! Thanks, Judi!! Love chimichangas. I usually bake them but they just don’t taste the same as fried but healthier. Pinned and shared. These particular ones were fried, but I usually bake, too. But fried ARE better, lol!!! This is a powerhouse of flavor. We love chimichanga’s but have never ha them with steak! I love the chili verde sauce and can think of several dishes that it would be wonderful on. And that’s why I love you, Mr. Fitz!! 🙂 Seriously, thanks! This sounds soooo good, and the sauce…yum !!! Hi Lynne, and thanks. That sauce is wonderful – it makes a great dip, too, for tortilla chips. I need this immediately! YUM! Thanks! I think you’ll love them. Wow sounds so delicious. Never had a chimichanga before and after seeing yours I know I have to have one. Yum! I love chimichangas and that sauce of yours looks scrumptious! Leftover steak almost never happens here though, my husband can’t eat his weight in steak… but I’m sure I can arrange something! lol, Carlee – toss an extra on the grill and sneak it away! That sauce is delish. Makes me want to lick the plate!! OK I am SOLD! I just love food like this and we do often have leftover beef in the fridge since the portions we were cut for our 1/4 cow we bought feeds 4 and we only have 3 in the fam. Thank you! Oh yum! I’m a little jealous of your cow! !